So her eis a template for the moves I wish for the people up there to fill out when I decide to put it up for other members to see, Move attacks may not do more than 1000 damage or 70% damage. Masochist: Kenkei reaches into his demon side and becomes a masochist, Damage done to kenkei is decreased by 95% until one of his opponents die. 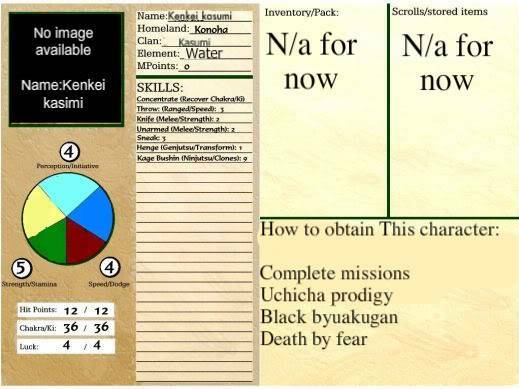 If all of kenkei's Allies are killed during Masochist Kenkei recieves 100% damage reduction until there is only one enemy left, This can only be used if Kenkei's chakra is 75% below its average. Now admins try... Make your own character and submit it to me I'm going to post this when You guys are done so that other people can submit their character to be in the rpg. Oh and images will be provided by me don't worry about it. u mean like naruto arena? Lol, its like it yes. But it is different in ALOT of ways. It is gonna be made by RPG maker VX. du we submit our charectors like in naruto arena? No as I stated mine above not The NA template! sorry (you typed alot) then how do i? Defense cannot sheild you completely from attacks unelss it is a bloodlimit for the next one. Buffs cannot target more than two people on your team. If you do not have a bloodlimit then just put two more Elemental releases or attacks. One of these have to be Attack and the other defence. They can violate the Restrictions of the Elemental attakcs having no limits. You can just have one also. This is complicated and the system is nto worked otu yet so Just tell me your bloodlimit and/or one huge special ability and I will transform it into a transformation (Like sage and/or The gates. The people listed above are already In and fixed. (Khashi has moves that hurt his teammates I hate you khashi) But other than that its good ^_^I still need 24 more. Laow: You hardly asked any questions and Gates are specials and taijutsu are not Counted unless they are special jutsu like.... Primary lotus, That is a special jutsu. Kirai is now apart of the System! Leaf Hurricane: Laow does a fast, swift kick doing 100 damage to one enemy. Leaf burning storm can be used the following turn. Leaf Burning Storm: Laow unleashed a powerful taijutsu combo on an enemy. Laow does 50 damage to one opponent and 75 the next turn. Oh well brandon has Toad Sage. Thats just two... If you can't come up with more I can finish it for you. And brandon thanks for reminding me. Lightning Release: Lightning current justu- Laow uses a electrical current to disrupt his opponents moves. The targeted enemy take 50 damage and is unable to us defensive skills for one turn. Yeah I got the Trans and Special covered.